The NASA-European Space Agency experiment aims to simulate conditions crew members will encounter on missions to deep space. What sounds like a dream job to some is actually the setup of a new experiment being conducted by NASA and the European Space Agency. The study, which kicked off Monday in Cologne, Germany, aims to assess the health effects of long-duration spaceflight by limiting participants' movements for two months. The study is being conducted at the center’s ":envihab" facility (from "environment" and "habitat") in Cologne, where the participants — 12 men and 12 women — will spend 60 consecutive days in bed during the entire 89-day study, which includes extra time for preparation and recovery. For their time, they’ll be paid 16,500 euros (about $19,000). More than a half-century of human spaceflight has shown that the microgravity environment of space causes the human body to undergo drastic and potentially dangerous changes. Without Earth’s gravity to pull things down, bodily fluids drift upward to collect in the chest and head, and bones and muscles waste away. Lying in bed for long periods can cause similar changes, so the study participants will do just about everything from their :envihab beds for the duration of the study. But lying in bed isn’t exactly a walk in the park. The participants’ beds are tilted slightly downward to encourage fluids to pool in the upper body. And to mimic the effects of microgravity on their muscles, bones and tendons, participants are required to minimize movement of any sort. That means at least one shoulder on the mattress at all times. 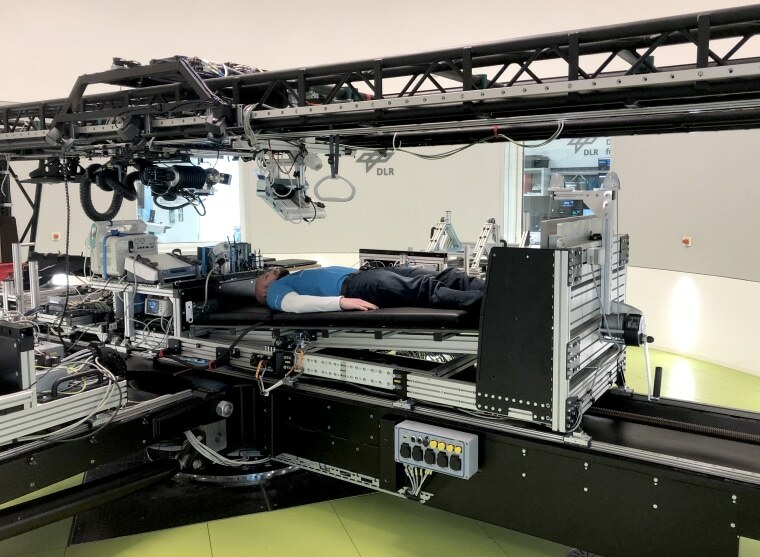 While lying in bed, some of the men and women will endure daily sessions in a “human centrifuge,” which spins like a carousel to create forces that simulate gravity. When they’re not spinning for science, they’ll be subjected to cognitive function tests, blood draws and muscle biopsies. If all that sounds good to you, you’re in luck. The German Aerospace Center says slots are still open for phase two of the experiment, which begins in September.